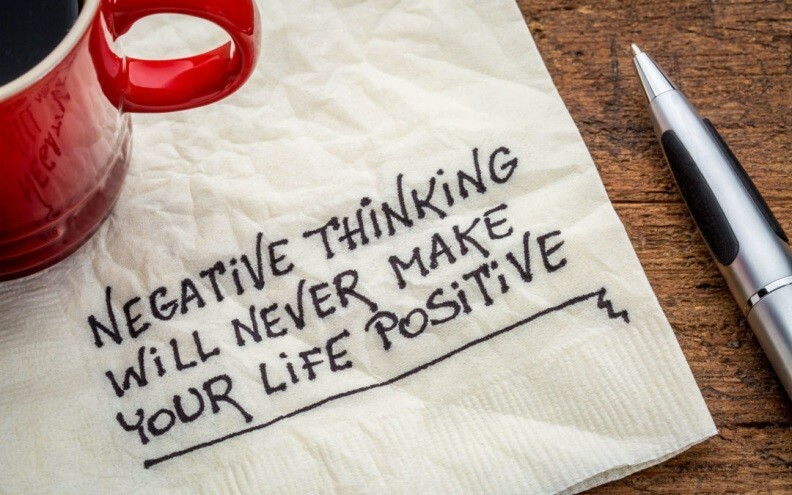 So, beware of that insidious disease known as ‘negativitis’ (negative thinking). It is as pervasive as the common cold, but far more damaging. It mutilates, cripples, and corrodes the human spirit. Those infected by it are broken men and women aimlessly plodding along. The dark clouds lingering over them obscure their vision and cause them to become confrontational, apathetic, and cynical. Their lives are like flat champagne, without any sizzle. So, how do we inoculate ourselves against such a terrible disease? It was only after learning about the horrible effects of smoking that people began to give it up. It may be wise to do the same here. So, let’s review the effects of negativitis. 1. Complaining is worse than doing nothing, for it is digging the rut one is in deeper and deeper. Each time one complains, it becomes increasingly difficult to climb out of the ditch they’ve created. To loosen the grip of this vicious habit, we need to become aware of our complaining, stop it in its tracks, and immediately look for something positive to say. It’s just a matter of replacing a bad habit with a good one. 2. A negative attitude is self-defeating. We won’t find solutions to life’s problems by looking for someone or something to blame. Those who say, “Positive thinking doesn’t work for me,” have got it backwards. It’s not positive thinking that has to work; you have to work. For example, you have to work at appreciating what you have instead of moaning about what you lack. 3. Failure to do what you want to do (be happy) causes physical and mental stress. A rotten attitude, not only delays success, but also shortens life by damaging the immune system (to learn more on how your thoughts affect your immune system, investigate psychoneuroimmunology). So, besides the diseases directly caused by stress, such as heart disease and ulcers, we become susceptible to all manner of other diseases because of a weakened immune system. 4. Do you know anyone with a negative attitude? How many years have they been that way? Two years? Five years? Ten years? That’s how many years of happiness and success they have robbed themselves of. Blinded by their own negativity, they are prevented from seeing the good around them. 5. One characteristic of negative thinkers is their need to have the world behave according to their wishes. They have never grown up and still live with childish demands. Whenever people and the world fail to act according to their selfish wishes, they are unhappy. Such a poisonous attitude prevents them from growing and learning how to cope with life’s challenges. 6. Everything negative we say to ourselves (self-talk) or to others is a suggestion. We are unwittingly practicing self-hypnosis, programing ourselves for failure, and creating self-fulfilling prophecies. 7. The negative world of our imagination creates an actual one that we are forced to live in. Take Ralph, for example. He’s always complaining about life. “Nowadays people are rude and surly. No matter where you go or what you do, you have to deal with ill-bred people.” As he said this, we made our way into a coffee shop. Once inside, we were greeted by a cheerful chap who asked us what we would like. Sighing (as if it took a great effect to speak), Ralph, almost inaudibly, ordered a medium sized regular coffee. When it arrived, he started complaining. Pointing to the cup, he said, “This is medium?” Without waiting for a response, he added, “You should have told me your cups are so small; I would have ordered a large one.” Despite the long line that Ralph was holding up, the man behind the counter tried to be patient. Without complaint, he took away the small coffee and replaced it with a large one. As soon as it arrived, Ralph looked at it aghast and bellowed, “You call this regular? There’s not enough cream!” The man behind the counter, who only a moment ago was cheerful was now upset and sarcastically replied, “Yes, for most people, this is regular, but if you insist, I’ll put in more cream. Perhaps next time you may want to ask for double cream!” I was next, so I got my coffee and joined Ralph at the table. “See,” he told me, “what did I say to you? People are rude.” Yes, in Ralph’s world, people are rude, but what he does not realize is he makes them so. 8. A particularly pernicious effect of ‘negativitis’ is that it sets one up for the mentality of a victim. Those with a woe-is-me attitude sit around in misery, waiting to be rescued. But they wait in vain because no one can rescue them from their own attitude. They are the only ones who can change it. And until they do so, they are condemned to continue suffering. 9. Another adverse effect of negativity is that it sets one up for the magic-bullet-syndrome. That is, the victim of ‘negativitis’ spends their time looking for a quick, easy fix, when none exists. By denying a fundamental law of life that states anything worthwhile requires effort to achieve, they achieve nothing. They won’t make progress until they realize that nothing in life is free. They’ve got to be willing to do what it takes to get what they want. 10. Also, beware of the fact that negative people attract other complainers. Because those who live in a world of doom and gloom alienate others, they have no choice but to look for other negative people to associate with. They then feed off one another and get locked in a clique of ‘losers’. 11. The constant stress that flows from a negative attitude also saps one’s energy, focus, and motivation. It is hardly a formula for success. 12. Also of great concern is the fact that those who refuse to work on improving their negative attitude may slide into depression, self-pity, and hopelessness. 13. Additionally, negative people not only harm themselves; they harm the world. They cease to make a contribution to it. Instead of helping, they spread gloom and misery everywhere. If they insist on infecting others, why not infect them with laughter? If they must carry something contagious, why not carry a smile? 1. Don’t identify with your failures or mistakes. You are not a ‘failure’ or ‘stupid’ just because something didn’t go according to plan. You are merely someone experiencing a temporary setback. How can you develop your analytical, coping, and problem solving skills without obstacles to practice on? 2. Let go of anger. Resentment, anger, and rancor are thorns. Embrace them not, for they puncture the heart, causing grievous pain. Release them and heal your wounds with the balm of forgiveness. 3. If you catch yourself thinking that you ‘have to,’ ‘must,’ ‘ought to,’ or ‘should’ do many things, rephrase your thoughts in a positive manner. You see, those words create stress and guilt, weighing you down. They also remind you of being forced to do things as a child, so they create resistance. Don’t let such words paralyze you. Instead, replace ‘OUGHT TO with ‘WANT TO’ + BECAUSE + SO. In other words, instead of saying, “I OUGHT TO lose weight,” say, “I WANT TO lose weight BECAUSE I will feel better, look better, live longer, and grow in confidence, SO I will join a fitness club and eat properly.” Rephrasing your thoughts places the focus on the BENEFITS you wish to receive and prepares you for action. 5. Don’t get suckered into the false belief that events or other people cause you to feel the way you do. The only one in charge of your emotions is you. People, or events, cannot make you upset, frustrate you, or disappoint you unless you allow them to. It’s a choice you make. If someone were to insult you, for example, you could abandon reason by reacting automatically and growing hostile. On the other hand, you could pause long enough to consider the situation and grow compassionate by wondering what would make someone so insecure that they need to provoke you. Compassion makes a lot of sense. After all, people need to be restored, renewed, revived, reclaimed and redeemed. And you can play a part in that. 6. Don’t be sensitive; be strong. Don’t interpret your boss’ glance as a look of disapproval. Don’t imagine that the guy who just cut in front of you on the highway did so because he disrespects you. Don’t think a rude remark made by a stressed out teen indicates that he doesn’t like you. The unpleasant feelings you have at the time of the above experiences are not caused by the events themselves, but by childhood memories that they have triggered. So, my boss’ glance, for instance, may trigger childhood memories of my father’s disapproving look. And the same feelings of insecurity and fear that I had as a child, well up into the present moment. So, let go of the past and live in the present. You are not a child; you are an adult. It is not your father; it is your boss. And you are doing a good job, so what are you worried about? 1. Get a good Cognitive Behavior Therapy (CBT) workbook and use it to turn your life around. Three good books are: Mind Over Mood: Change How You Feel by Changing the Way You Think, Feeling Good: The New Mood Therapy, and Cognitive Behavioural Therapy Workbook For Dummies. Just one of the three above books, or any other good CBT workbook, will do. Keep in mind the object isn’t to learn about CBT, but to practice it by doing the exercises. 2. Act as if you already have a positive attitude. This is a very powerful method, for even if you’re just pretending, the people you interact with don’t know that, so they respond in a very positive way. And their favourable response makes you feel good, which then leads to your positive thoughts and behaviour. Have fun with this effective technique. Pretend you are a famous movie star or a notable theatrical performer and give your best performance. Each time you use this technique, you are using others to mold your personality. It’s a life-changing and magical technique first expounded by William James. 3. Most of the time we act on auto pilot. That is, we act without thinking, or unconsciously. To develop your power of choice, you need to get into the habit of making conscious choices and immediately following through. Why is it important to strengthen our power of choice? Because the power of choice is the power to change. And once we have the power to change, we can change our attitude or any other bad habit. 4. Motivate yourself to change and reinforce your positive behavior by monitoring your progress. Keep a gratitude journal and a victory journal. Record your successes and what you are thankful for. 5. Beware of what you say to yourself and others, and be careful of what you daydream about because every time you speak or daydream you are programming your subconscious for success or failure, for a positive or negative attitude. Make sure whatever you say or daydream about is positive. 6. Take vitamins for the mind; fortify your mind with inspirational and motivational books, videos, and CDs or audio files. 7. Focus on what you can do, not on what you can’t. Remember, “I can” is more important than I.Q. 8. Would you say that the Internet does more harm or good? I’m surprised by how many people believe it does more harm than good. Perhaps this is a good example of finding what we look for. By that I mean when we look for something to complain about, that’s what we’ll find. Returning to the Internet, instead of looking for the harm or good, suppose I look for the facts. What do the experts say? 10. Here’s another helpful book, Little Gold Book of YES! Attitude: How to Find, Build and Keep a YES! Attitude for a Lifetime of SUCCESS by Jeffrey Gitomer.